"Made of plastic, it’s perfect for withstanding the elements, and it holds up to 2 gallons of water." "With its small size, this model is better suited for indoors and those without out a ton of plants." "This model comes in a 2 or 1-gallon size so you can choose based on how many plants you have or how much you can carry." "This will also stand up to all of the elements outside meaning it won't rust or warp when temperatures warm and rise." "It’s built to be tough, yet it’s still lightweight and holds up to 3.2 gallons of water." "This model only holds 2 quarts so it will be light enough for them to carry around." "It’s great for indoors with its small frame and contemporary design, making it a decorative piece to leave on a bookshelf." "This unique watering can has not only a traditional spout for all your watering needs, but there’s also a mister built into the handle." For a solid, basic outdoor watering can, you can’t go wrong with this bright blue one from OXO. Made of plastic, it’s perfect for withstanding the elements, and it holds up to 2 gallons of water, so you can get the job done without too much back and forth. There's a rose attachment that provides a finer spray, but you can also take it off and store it in a space at the back of the can. Handy! The spout rotates for easier filling and storage, and there’s a clear line in the middle so you can see how much water is in there. The handle has a non-slip surface to make carrying it easy too. This watering can measures 13.9" x 7.6" x 9.7", and it also comes in fuschia and a bright green. Spending an arm and a leg on a watering can is probably not at the top of your priorities. And if you just have a few indoor plants or some flower boxes outside you don't need a large watering can. This can holds a half gallon of water and has a long spout which makes it a great option for those who have plants up high. It is made of a UV resistant plastic so it won't fade over time if you leave it in the sun. With its small size, this model is better suited for indoors and those without out a ton of plants. Reviewers note it gets the job done and it is pretty to look at if you have to leave it out. If you are watering your plants outdoors with a watering can instead of a hose you'll want something that gives your plants a lot to drink and that is when you'll want something that provides more of a shower stream them a spout which is better for indoor plants. This model comes in a 2 or 1-gallon size so you can choose based on how many plants you have or how much you can carry. It also comes in five colors so you can go for green and have it blend in or opt for something bold with the purple model. Did we mention it also comes at a bargain price? Vintage looking cans like those made out of galvanized steel look pretty no matter where they lie. Leave it in your garden or stow it in your shed — these old time favorites serve a purpose of both looking good and watering your plants. With a watering can made out of steel, water will stay cool if it sits in there for a while. This will also stand up to all of the elements outside meaning it won't rust or warp when temperatures warm and rise. This model comes in a 1.5, 2, 2.5 or 3-gallon size so you can pick a watering can that works for your watering needs. It also has a handy handle on the top which will make it easier to carry around your yard. Reviewers love the old-school look that is American made and many note this has held up better than plastic versions they've had in the past. 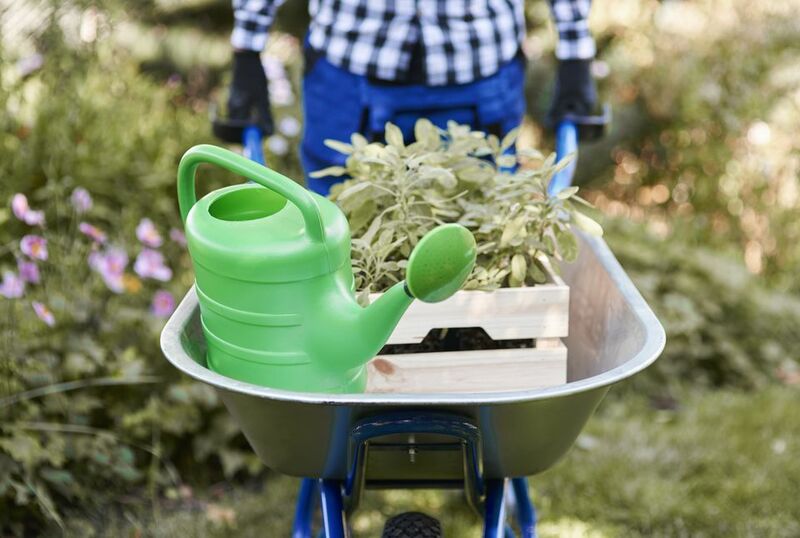 If you’ve got a lot of watering to do, this Rainmaker watering can is the one for the job. It’s built to be tough, yet it’s still lightweight and holds up to 3.2 gallons of water. Make it rain, indeed. There’s a detachable rose spout if you want a finer spay, and there are two handle positions, so you can select which one is most comfortable for you. The fill hole is small too, to prevent a bunch of splashing as you deliver the water to your thirsty plants. Get your kids in on the watering action with this adorable elephant watering can. They can fill him up and be happy to help with your weekly watering chores. This model only holds 2 quarts so it will be light enough for them to carry around, but you might need to refill it a few times if you have a lot of plants. If you want to get really cute, opt for the pink model that will have the whole family giggling. Sleek and shiny, this watering can gets points for functionality and style alike. Made of solid stainless steel, it’s built to last. It’s great for indoors with its small frame and contemporary design, making it a decorative piece to leave on a bookshelf. This can only hold 32 oz. so it is only suited to water a few plants before a refill is needed. It’s a mister. It’s a watering can. It’s Sprayman. This unique watering can has not only a traditional spout for all your watering needs, but there’s also a mister built into the handle so you can spritz those that need spritzing along the way. No need to make a second trip. You can even do both at the same time. The can holds 40 ounces of water, and it stands about 11.5 inches high. It’s made of a light green plastic that is sturdy, yet still opaque enough that you can see through it, so you know when the water is running low.